A cooling cream with the combined qualities of organic tea tree & lavender which comes to the rescue whenever your skin is in need of a helping hand. Tea tree & lavender are so useful that we thought weâ€™d join them together in this recipe so you can benefit from the best of both. It can be applied to problem & upset skin. Use a little of this cream whenever your skin needs a bit of extra TLC. Apply as often as required. 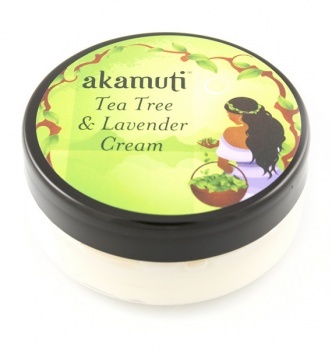 This cream can be used alongside our Tea Tree Wash.
Sweet Almond Oil (Prunus dulcis), Peach Kernel Oil (Prunus persica), Apricot Kernel Oil (Prunus armenica), Organic Beeswax (Cera alba), Organic Tea Tree Essential Oil (Melaleuca alternifolia), Lavender Essential Oil (Lavendula angustifolia).